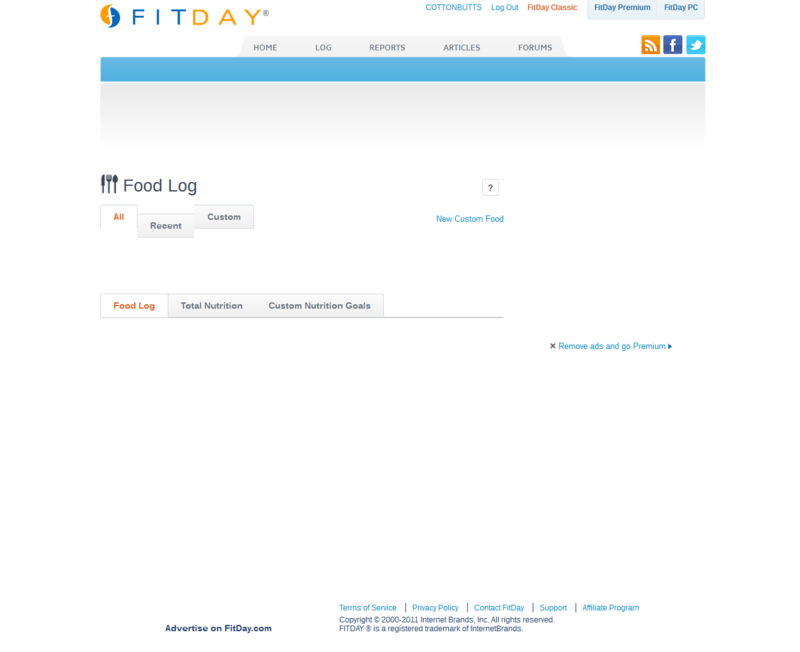 The issue with the script being used on Fitday 2.0 is really causing problems for a few of us at work. I work in the IT Department and I've tested this on a number of computers running Windows XP and Windows 7. I've tried Chrome, Mozilla and IE8, all of which are locking up the browser when you enter food into the log. Using Chrome and IE8, the script uses about 25% of CPU and hangs indefinitely. Mozilla after a period of time detects that the script is taking longer then it should and has a problem and gives you the option to exit the script after which you can enter the next food item. The problem occurs again though. My colleague indicates the issue is occurring on his Mac also. Hopefully it gets fixed soon. Thanks. Thanks for posting; a number of folks have also indicated this is a problem. Two things come to mind, though I don't have the technical information for you. First, check this section to see if there are any thoughts in the previous threads that have been posted regarding this (I can't remember the content off the top of my head), and second, if you can post a screen shot of what's happening, that may help the folks on the tech end. I understand it's really frustrating. Congratulations, though, on your results so far! So I am still having issues on my home computer running Windows 7. The screenshots in this post are from my work computer and home computer at the help desk running windows XP. I took screen shots of what was happening in Chrome. Do you guys need more information for this? Whats happening? Future updates? Another here having issues. Firefox 1.5.0.1, running NoScript and AdBlock Plus (persists with both disabled). Same as reported above: long hang times and unresponsive pages/scripts. Page "loading" animation plays in the tab indefinitely, requires a ctrl+f5 to interrupt. I wasn't sure what was going on at first since the site has run very slowly for me the entire time I've used it. I just assumed the hosting was a little on the cheap side or something, as it feels a lot like a site getting choked out by bandwidth issues. This is either day two or three on the 2.0 website being totally unusable because of script lock ups. Synching to FitDayPC works, so does the old website. I'm trying to use it under the latest versions of FireFox on Windows 7 and OSX. Exactly the same problem. My system freezes as I try to use the food log. Very problematic situation. Where do we call for help? or ot get a refund for the year pais in advance. This is my first day. I wasted my money. It's a nice site, but no replies to queries? What's up with that? How do you get your money back? What errors are you seeing exactly, and what tasks are you trying to perform when you see them? Also if you can report your browser type & version that would help us diagnose if it's local to you, an issue with a single browser type, or a more general FD issue. Also, try logging in using a different browser. We find Firefox works best, Chrome is excellent, and IE has more problems than either.